Our beloved smartphone world has become more and more boring, at least in terms of design. This has been the case for a long time, but at the moment this is becoming more and more noticeable. It’s difficult to surprise the market with a fresh design, which is repeatedly proven with each new release. 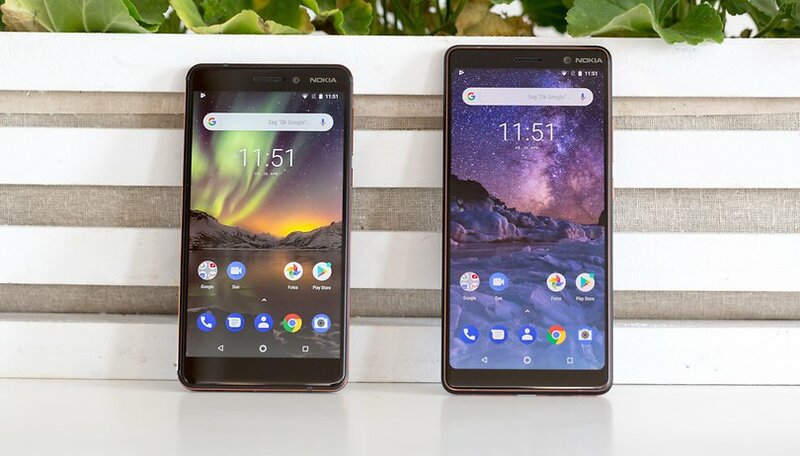 With the Nokia 6.1 and 7 Plus, however, HMD Global has shown that a smartphone can still stand out, and I am thankful for that. The Nokia brand has been with us again for a good year and a half, and every smartphone fan out there is happy about that. HMD Global has proven itself and shown that they understand how the mobile communications industry works. They have made many good designs and have been true to themselves. The design of the smartphones is still reminiscent of the Lumia’s smartphone with Windows, and that’s a good thing. Nokia’s Windows phone devices often sold for just one reason: because of Nokia. I experienced this for five years working in a smartphone shop. Many customers bought the smartphones with Microsoft’s operating system because they were fond of the Nokia brand. It’s just a pity that the Windows phone wasn’t able to assert itself, and Nokia ran into some problems as well. Fortunately, HDM Global’s acquisition of the brand was successful. We were already impressed by Nokia’s smartphones last year, as they were the manufacturer's first actual smartphones. Of course, it’s easy to explain why this worked. Many of the old employees are still there. You can feel this in every new model; they all bear Nokia’s signature, and that’s what’s so exciting. Nokia phones have always stood for quality and durability. It hasn’t changed with the new models, and it's gotten even better. The design itself isn’t particularly original and the devices look like the smartphones to which we're accustomed. But nevertheless, Nokia manages to set itself apart from the competition. But how? It’s all about details and above all materials. The smartphone world has been converging for some time now, at least in terms of design. Bezel-less displays, fingerprint sensors on the back, glass rear and ordinarily a similarly-arranged dual camera, and now the trendy notch: there’s seemingly just one formula for success. The Huawei P20 Pro is just the latest iteration. It’s an impressive smartphone, but the design won’t knock your socks off. Apart from the quite spectacular effects on the back, the smartphone is practically indistinguishable from many competitors’ models. Even though I handle many of these smartphones every day, I still catch myself misidentifiying them. Nokia has deliberately taken a different approach in some cases. Glass on the back? Nope, that’ll just break. A frame that reminds you of the competition from Korea or California? Rather not, since Nokia can do it better, or at least do it their own way. Of course, their new devices also come with a round fingerprint sensor on the back, as well as the dual camera. But at least they haven’t placed the camera on the upper left like many competitors have from China. Instead, it’s in the middle. And then there’s the colors! The new copper-colored accents inspire. In combination with black, it looks simply great. And Nokia doesn’t make the mistake of overdoing it. Especially with the Nokia 6.1, the accents are subtle, but still stand out. Design is of course a matter of taste, but you can hardly confuse the new Nokias with another smartphone. By now you might realize I’m a fan. That certainly didn’t happen overnight. Nokia has worked hard to gain a following and deserves this recognition. The fact that the manufacturer is now running its new phones on Android One just adds to my excitement. Of course, the Finnish manufacturer has to prove that they’ll keep their promises about updates, but the signs are clear. The update situation in the Android world is getting worse and worse, and Nokia’s switch to Android One will have a positive effect, as Nokia will at least guarantee two years of steady updates. What other manufacturers can currently say the same thing? More smartphone manufacturers should do what Nokia is doing and offer two years of steady updates. If Nokia continues on this part, I’m pretty sure there will be a lot to look forward to. I don’t think they’ll start creating devices like the iPhone X and Samsung Galaxy Note 8, but they will produce really rock solid, up-to-date and beautiful smartphones for the masses. And that is exactly what I think is good and healthy for the industry. To be honest, I don’t need any more 1000 dollar device. Great software, decent performance and an appropriate camera are enough. HMD could just try working on their name a little bit. What do you think of Nokia’s new smartphones? Can you imagine switching brands and joining the Nokia bandwagon? Frankly speaking, I also find the new Nokia phones to stand out & definitely have a better build quality. Well, it's their strategy. They know that they can't compete with Apple and Samsung yet, so they don't even waste time and money on it, which is smart. The Nokia 8 Sirocco is the first one that asks for a similar price as the S9 for example. Thing is, do we really need $1000+ phones? Looking at the offerings at around $500 I really dont think so. I think the WOW factor has left smart phones. It has been replaced with glass and gimmicks. Anxious to see how Nokia's camera evolves with their next iteration. In the meantime, missing the matte finish and toughness of my Lumia 950 (not to mention the all-conquering capabilities of Cortana) I am increasingly tempted to put my SIM card back in and use it as my daily driver again. I agree. No one even sees what the phone looks like once the cover goes on so who cares? Most people cover their "trendy, colorful, stylish" phones in cases to protect these overprices (IMO) devices. What use is a flashy colorful phone, if you cover it up? More overpriced BS if you ask me.